I used to be that chic that hid her feelings behind a smile. After going through so much hell, I realized that I allowed people to treat me the way they wanted without saying a word!! I made a decision a long time ago to make my hurt be known to those that hurt me. How will a person know what you will or won’t accept if you don’t tell them. Now, if I tell you something hurts me and you continue to do it and I allow it THAT’S ON ME! YOU ARE IN CHARGE!!!! Whether it’s in a relationship, work, family, or friends. You have to teach people how to treat you! If you attempt to gossip with someone and they consistently tell you they don’t wanna hear it you’re less likely to keep attempting to gossip with them correct?? If a family member come at you wrong and you don’t let them know, how can they fix it?? No one has the right to continue hurting someone over and over again with no consequences. If a person can’t treat you how you deserve to be treated they have to be aware that you may walk away. That’s a consequence of one’s actions! No one likes to be hurt, especially by someone they love. Many times once you express you’re feelings , you don’t have to revisit the conversation. You can then forgive, continue your relationship, and grow from it! 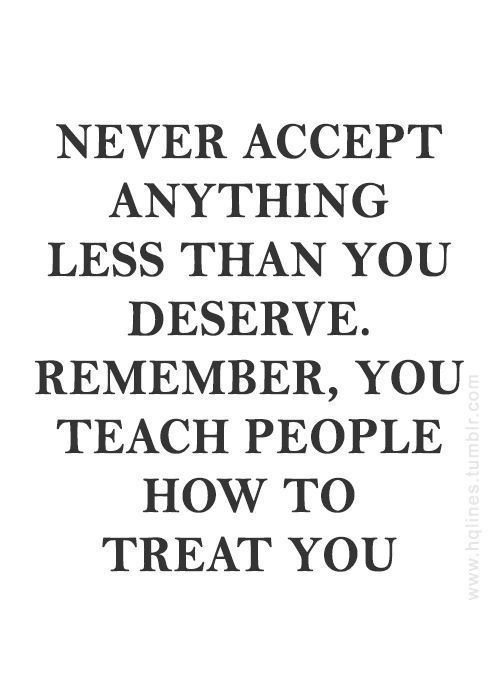 Draw your line and show people how to treat you, NEVER accept less than you’re worth!!!! YOU ARE IN CHARGE OF HOW YOU’RE TREATED!! ← Don’t be a hypocrite! !